The term Long Beach is not a misnomer, for here is a beach of hard white sand as level as a floor extending many miles each way. This beach is a perfect natural race course, and during the season spanking teams from the city can always be seen dashing over this superb drive-way. There is a long pleasure wharf. My collection of old pier photos includes a picture taken near downtown Long Beach back in the 1920s. 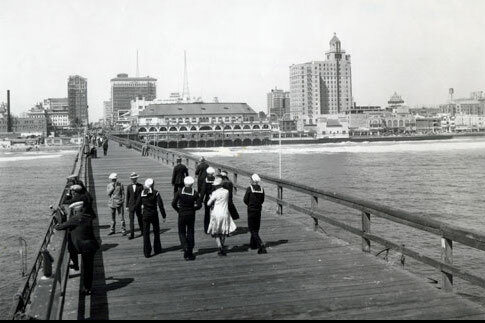 The view looks shoreward from the end of the Pine Avenue Pier and in the foreground a group of sailors, and one young lady, strolls toward the beach. Off in the distance is a long, wide beach, and just beyond the beach are several early-day skyscrapers (or at least large office buildings). It is a picture typical of many beachfront towns. 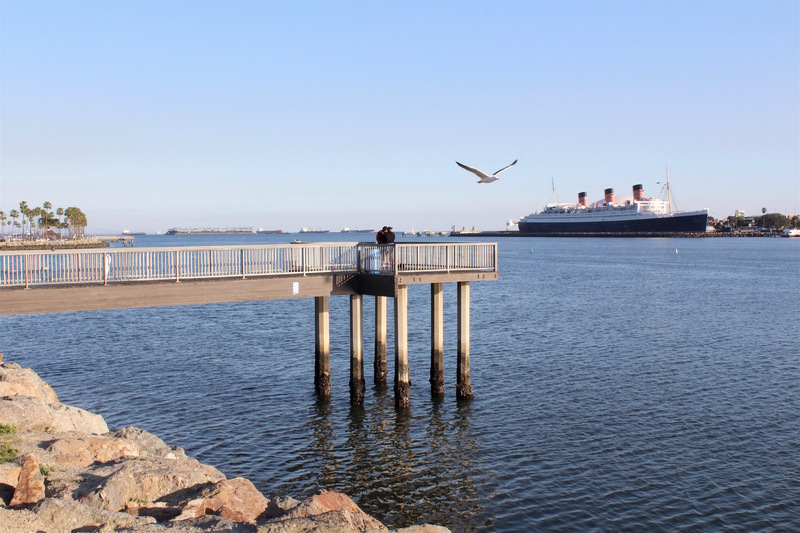 Today, a large marina, a shopping complex, and an aquatic park have replaced what once was water and pier. A true and important piece of Long Beach history seems forgotten. However for the angler, all is not lost. The area is also home to five small piers that jut out from the shoreline surrounding the park. Unfortunately, because of their small size, the piers themselves offer little in the way of facilities; and there are limited parking spaces. Nevertheless, the piers themselves offer an easily accessible fishing spot and attract a steady clientele of regulars from the area. 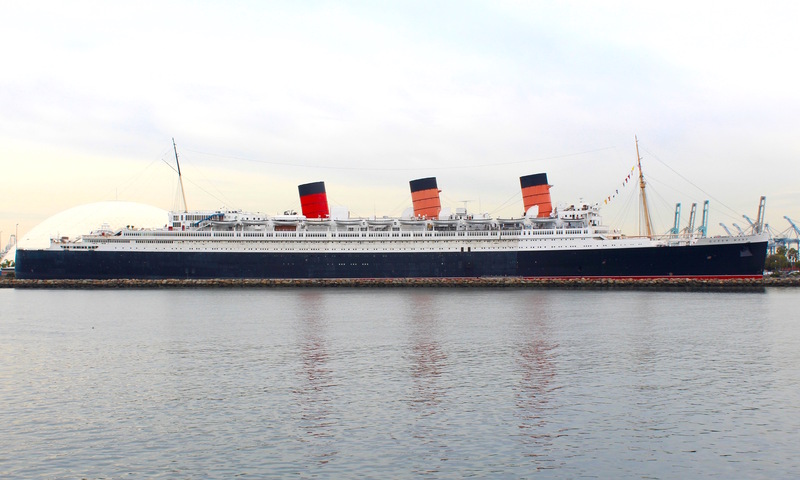 They also offer one of the best platforms from which to view the majestic Queen Mary—once one of the world’s greatest ships. Environment. Each of the five piers sits in Queensway Bay. 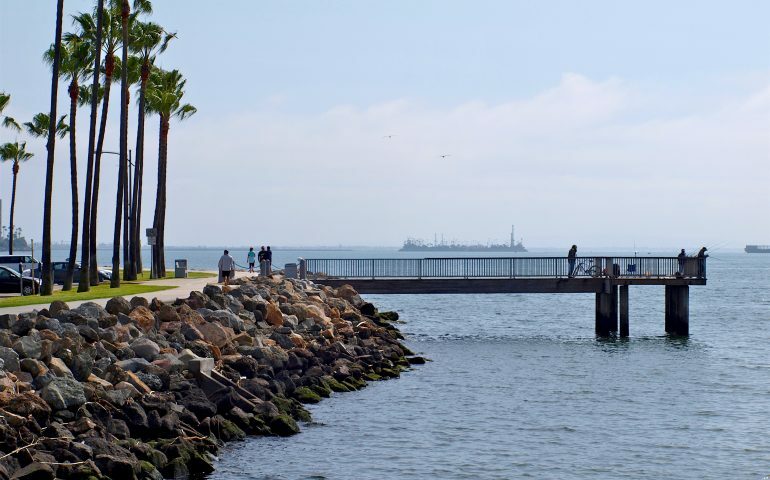 The three southernmost piers sit on the outer edge of the breakwater that protects the Downtown Long Beach Marina—just out past the Shoreline Village shopping complex (and they are sometimes called the Shoreline Village Piers). 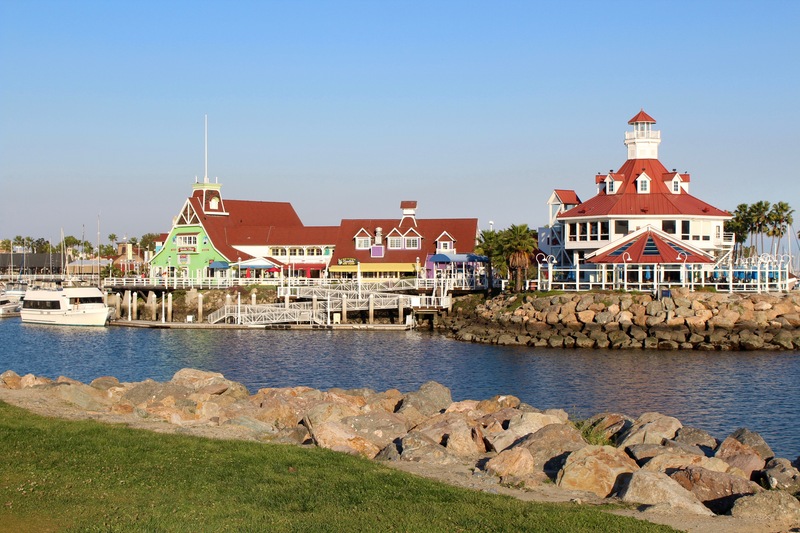 The two northernmost piers sit on the outer side of the peninsula that protects and forms the waters for the Shoreline Harbor Marina and the Shoreline Aquatic Park Lagoon. To the north of Queensway Bay is the entrance to the Los Angeles River, to the south and east are the larger areas of San Pedro Bay. The entire area is heavily used by boats of many types and the water itself is less than pristine even though it still contains many fish. 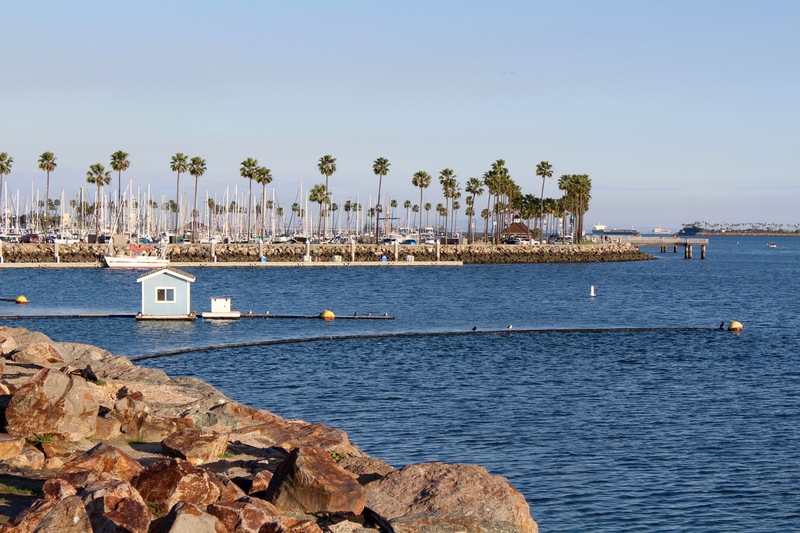 Each of the piers is short, only about sixty feet long, and all were constructed in 1982 along with the Downtown Marina. Sitting as they do on man-made breakwaters, the piers see a typical bay bottom, mud and sand, together with a rocky shoreline area that in many spots is heavily covered with fish attracting mussels. 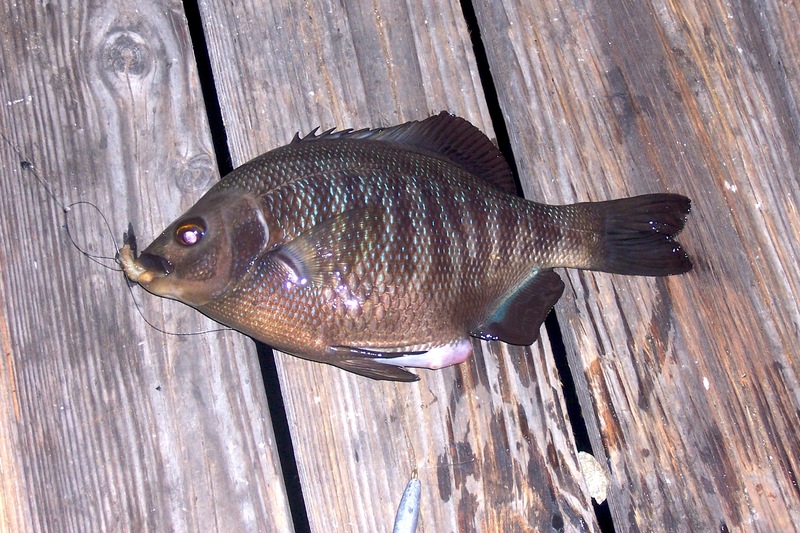 Inshore, along the rocks, anglers typically catch opaleye, several varieties of perch (especially black perch aka buttermouth), and a mishmash of other rock-frequenting species including rockfish and sculpin. Casting out perpendicular to the pier into the waters that parallel the shoreline often yield the best catches including some nice bass, mainly sand bass and spotted bass, yellowfin croaker, spotfin croaker, sargo, perch and halibut. 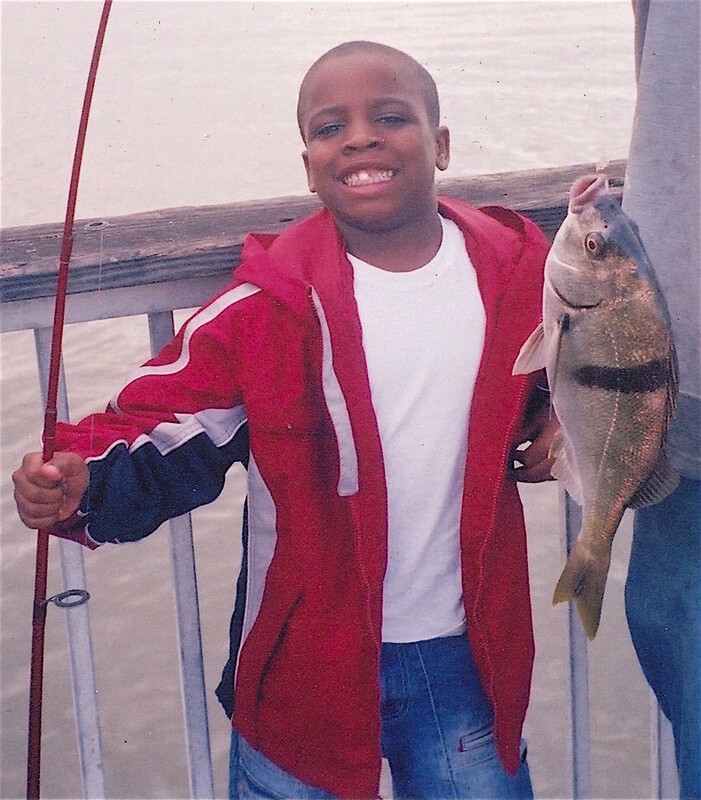 Fishing under and around the pier itself typically yields jacksmelt, small shinerperch, bass and mackerel. Casting out toward the deeper waters, away from the pier, most often yields white croaker (tom cod) and queenfish (herring) but will also offer up some of the larger croakers, sand bass, halibut, diamond turbot and the sharays—sharks and rays. 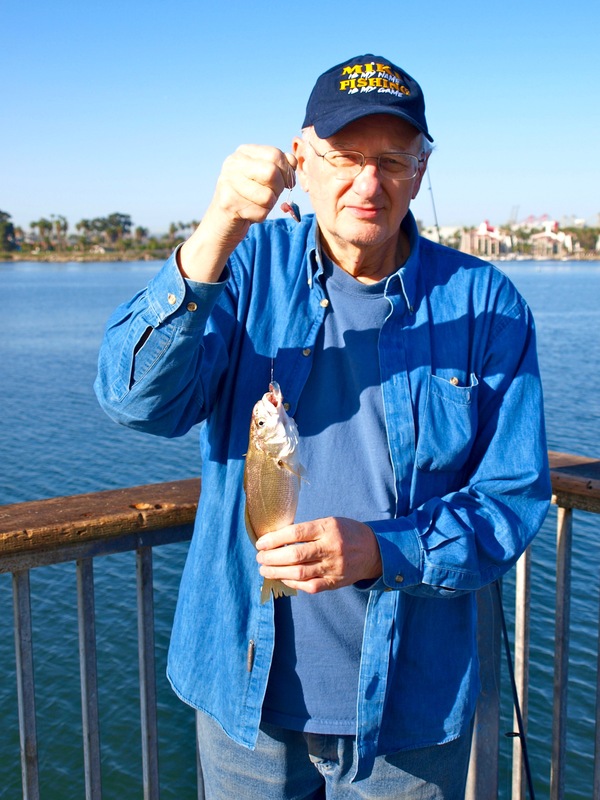 Reportedly, although I find it a little hard to believe, the northernmost piers also see an occasional catch of freshwater catfish and carp, misplaced species from the Los Angeles River. Fishing Tips. The piers tend to have a Jekyll and Hyde, very good or very bad, nature. Early morning and late evening hours are by far the best times to fish these piers and two different riggings are appropriate here. 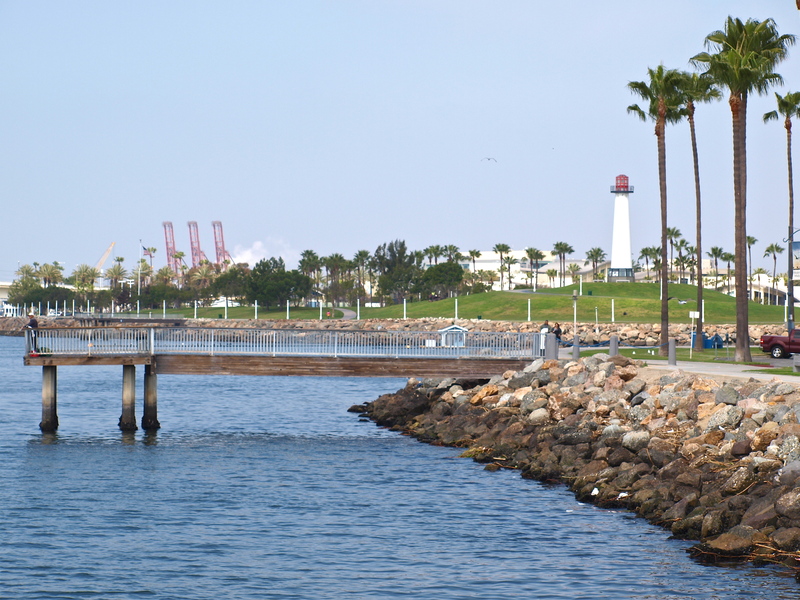 Use a light set-up around the piers and the inshore rocky areas. Fish a heavier rod for the areas out away from the piers. Inshore, fish on the bottom, right around the rocks using a high/low leader, small size 6-4 hooks, and mussels or bloodworms for bait. The result will often be bass, seaperch, opaleye, sargo, rockfish, or other interesting rocky-environment-type fish. 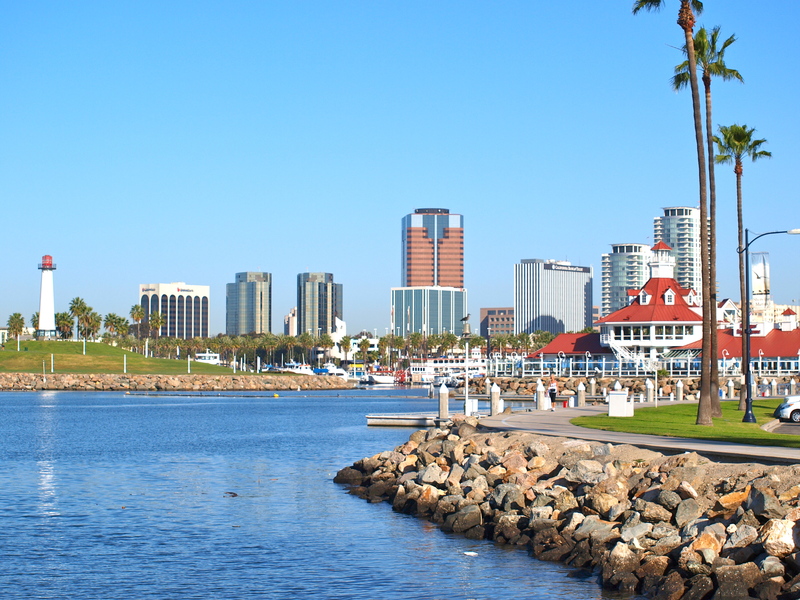 As example: several years ago I was attending the Fred Hall Fishing Show in Long Beach. Since the show gates didn’t open until noon, I figured I could get a little fishing in during the morning hours. Right at the crack of dawn, and during a good high tide, I headed down to one of the piers. In two hours I managed four kelp rockfish, two blackperch, one cabezon (13”) and a black and yellow rockfish. Not a great catch but some good variety. The rockfish were down in the crevices between the rocks while the perch were about ten feet out from the rocks. Fish directly under the pier or around the pier with a bait rig (Sabiki or Lucky Lura) with size 8 hooks for jacksmelt, butterfish and sometimes a few queenfish. Usually all that is needed is a slight up and down motion although you may need to sweeten the hooks with a small piece of bait. Cast out into the deeper water out from the pier if the tomcod (white croaker) are making an appearance. Use size 4 hooks baited with small pieces of anchovy for the tommies. If mackerel show up, switch to a single hook baited with a strip of squid or a piece of mackerel; use a split-shot sinker for weight. You can of course often catch the mackerel with the bait rigs but if the schools are thick, you may be pulling in 3-4 at a time. Eventually the whirling dervish action of the macks will leave your $2-3 leader twisted and tangled and headed for the nearest trash can. Remember that the early evening hours into the night are generally the best times for spotfin croaker, yellowfin croaker, and sargo. Try fishing on the bottom with a Carolina rigging or a high/low leader using size 6-2 hooks. Best baits are ghost shrimp (the best), bloodworms, lug worms, or fresh mussels for the croakers and grunts. Sand bass too love the evening hours and will take all of the above-mentioned baits as well as anchovies and artificial lures. Mixed in will be a variety of other fish including turbot, blackperch, and a few sharks and rays. Halibut are primarily taken during the daylight hours and love a lively bait (small smelt, queenfish, shinerperch, etc.) but will also hit plastics (i.e. Fish Traps, Big Hammers, and Blams). Some of the locals began calling the pier “Blam Central” in 2007-2008 due to the success of “Blam” lures those years. A Halloween-colored (green and orange) Blam produced numerous legal-size halibut including a 26-pound fish in October of 2007 by “Cedric.” And though the lure has produced a number of big bass, primarily sand bass, the most unusual fish was a 9-pound striped bass that was taken on an identical Halloween-colored Blam the same month as the big halibut. Don’t know what the striper was doing in the southland. The key, according to locals, is to fish the sides of the piers and fish while it’s dark (morning or evening). Unfortunately, it’s getting hard to find the Blam lures. 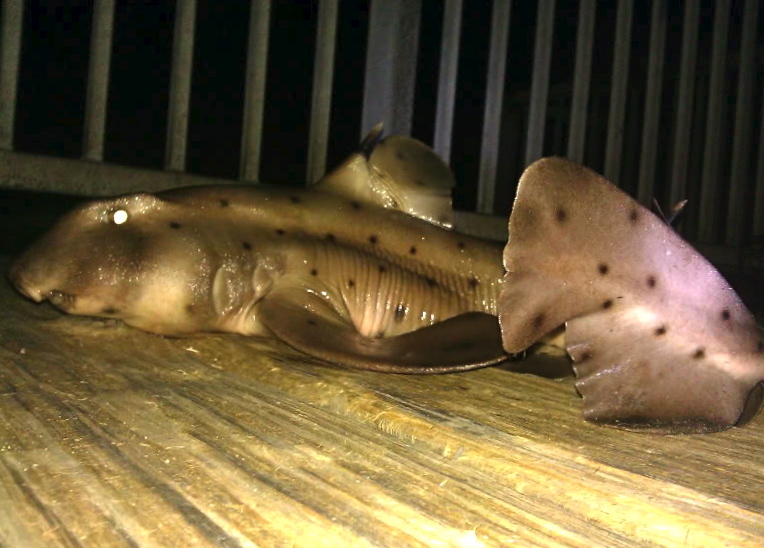 As far as the sharks and rays, several types, fish on the bottom, away from the pier. Typical bait for these is squid or mackerel; be sure to use heavier rigging and have a hoop net to bring the big girls (the big ‘uns are usually females) up onto the pier. One final note is the issue of angler safety. Given that fishing is often best at night, it‘s wise to be in a group. It’s a beautiful area during the day but can be less hospitable at night. What great day for anglers out there today—between the last pier and the rocks. There were about 20+ people out there… seems everyone was fishing for the same thing, perch and sargo. Lots were landed today I caught nine myself in the front area of the pier. A lot of small halis were being caught and released. All the smelts people were catching were too small for anything big to hit it sadly. So we got there at 3am and there was a lot of sargo bites as well as sand bass bites. I landed two sargo, one at around 3 1/2-4 lbs and two bass 1 released. As we walked up we saw a group a guys with some nice keeper bass in their buckets… We used ghost shrimp and bloodworms and it seem that bloodworms is the bait to go with…. Bonito are still running through the area as well as herring. I saw a load of baitfish all around the pier so I’m sure there are some halibuts somewhere within the area but I didn’t see anyone fishing for them today. My advice for anyone who goes out there will be to fish from night- 8/9am.